This week’s outfit choices revolve around this amazing chain link diamond pave and rose gold bracelet. Would you err towards the trendy side by pairing it with with floral print skinny jeans, a breezy cream tank top, peach boyfriend blazer and matching peach Diane Von Furstenberg wedges? Or will you take the classic route in a periwinkle silk DVF shift, Reed Krakoff heels, Christian Louboutin & matching inside out hoops? Your weekend, your choice! 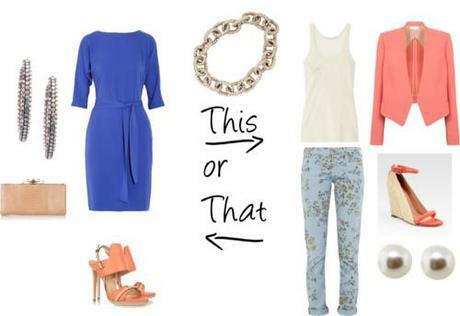 Which look would you wear? Liz for Raymond Lee Jewelers, your source for fashion trends, diamond jewelry, luxury estate jewelry, and designer jewelry. Originally Published on the official Raymond Lee Jewelers Blog.